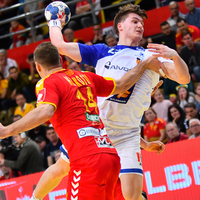 Round 4 of the Men’s EHF EURO 2020 Qualifiers concluded on Sunday night with two crucial matches: First, North Macedonia and Iceland drew in a real thriller, then Croatia booked their EHF EURO ticket by clearly beating Serbia. Before the Croatians, Germany and Slovenia became the first two teams to clinch their EURO berths. The fans in Zadar had much to celebrate – both the EURO ticket and a clear win in the duel against arch-rivals Serbia. After the 25:25 draw in the first leg on Thursday, the rematch was a one-sided affair for the hosts, who are now on seven points. After the score of 9:5, the distance was only once lower than four goals, at 18:15. When the Serbians missed two penalties in the middle of the second half, the deal was sealed. At 25:19 in minute 53, the winner was confirmed. Serbia have to win both remaining qualifiers, against Switzerland and Belgium, and hope for a Swiss defeat versus Croatia to keep the flame of hope for second position alive. On Wednesday, Dejan Manaskov was the Macedonian hero, scoring the buzzer-beating winners’ goal for the 34:33 away victory in Iceland. On Sunday, Manaskov also had the chance in the last attack of the match but did not convert into the necessary goal. Some seconds before, Elvar Örn Jonsson had levelled the result in a real thriller, attended by 8,000 fans in the sold-out Arena SC Boris Trajkovski. In total, the lead changed eight times. After a more or less equal first half, Iceland forged ahead to a three-goal advantage before the hosts turned the tide for 20:18. Then it was Iceland’s time again at 22:23, before the Macedonians entered the final minute with a 24:23 lead. Four seconds before the end, Jonsson equalised, followed by the final Macedonian timeout. Filip Kuzmanovski shot, the ball was blocked and rebounded to Manaskov, who committed an offensive foul with the final buzzer.